While LED manufacturers are bringing more and more high power COBs to the market like Lumileds COB 1216, Citizen’s CLU550, Cree’s CXB3590 and Bridgelux’s Vero 29, MechaTronix announces their new CoolBay® high bay cooler program. The CoolBay® is a passive round cooler based on the patented CoolTube® quadruple closed-loop heat pipe structure, which makes it the most compact design on the market cooling down up to 35.000 lumen. The CoolBay® comes in 2 power platforms, The CoolBay® Giga up to 22.000 lumen in a diameter of 152mm and the CoolBay® Tera up to 35.000 lumen in a diameter of 192mm. These sizes are specifically chosen to match the design with the diameter of the round high bay coolers from Mean Well, the HBG series. 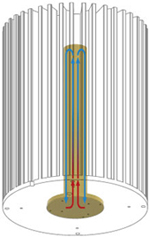 The extreme high conductivity of the CoolTube® in the center of the cooler transports away the heat loss from high power density COB led engines and is designed in this way that it can be used in any orientation, what makes it possible besides high bay developments to use the cooler for industrial lighting applications like high power flood lights or high mast lights. With this new platform MechaTronix went further than keeping the LED dies at the correct temperature. In many high bay designs the lifetime of the LED array might be thermally well designed, but the drivers used in these applications mostly are integrated on top of the cooler in an IP67 box, what makes that the electrolytical capacitors of the driver experience an ambient temperature between 50° and 60° Celsius. The CoolBay® comes with specific mounting options so that the driver sits remote from the led cooler, what easily drops the driver temperature with 10 degrees.